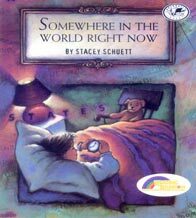 Summary: This book uses as its premise the fact that people who live in different places in the world are engaged in different activities because it is not the same time everywhere in the world. Each page gives a description of what a person or creature is doing at a particular time of the day or night. In the background of each illustration the reader will see part of a map or the names of places in the particular part of the world that is being written about on the page. The actions in the book take place over a 24 hour period of time that begins and ends at nighttime. Literary elements at work in the story: This story has multiple settings as the reader is taken on a journey throughout the world through the illustrations and words in this story. These settings show the uniqueness of God’s creation and point out the fact that somewhere in the world there is always some type of action taking place. These settings remind the reader that s/he is one small part of a great big world in which many different kinds of people and animals all live together. Perspective on gender/race/culture/economic ability: The illustrations in this book show the reader that not all people in the world look the same and do the same things as the reader may do. People of different ethnic/racial backgrounds are shown. Sometimes we forget that not everyone is exactly like us. This book with its illustrations does a good job of showing many different aspects of God’s creation. Theology: God created everything in the world and gave breath to all the people who live there. The power and divinity of God though invisible can be seen and understood through all that has been created in the world. What do you become aware of when looking at the very first illustration in the book with the baker, the mouse, and a person watching a movie in it? How can tomorrow already be here in some places? How is the illustration of the family eating breakfast similar to what happens in your family? Different? Compare the double page illustration of the people going home from work on the trains and streets to the next illustration of the family in Guatemala. What do these pictures tell you about how the day ends in different parts of the world? Somewhere in the World Right Now by Storypath is licensed under a Creative Commons Attribution-NonCommercial 4.0 International License.